Friends Hospital, the nation's first private, non-profit psychiatric hospital, reaches a larger demographic by combining a fresh contemporary approach with their warm and inviting Quaker values. Friends Hospital is evolving. As one of the first organizations of its kind, their list of programs and services are growing to accommodate a larger audience, and so they want to reach outside of the Philadelphia area and attract a wider demographic of patients looking for behavioral health services. Friends Hospital is still a leader in the industry, as they launched the only program in the area for professionals needing these services. While they were interested in rebranding to satisfy this new, more upscale concept, Friends wanted to keep the same comfort level established by their Quaker values since 1813. DDA discussed new marketing themes with Friends Hospital that combined a new sense of purpose, productivity, and accomplishment that is key to wellness while being mindful and sensitive to all who may be on this path to recovery. These themes are woven throughout each of the 6 waterfall inserts included in a full color folder brochure that highlighted the Friends Hospital programs treating psychiatric conditions in adolescents, adults, and seniors, from students to professionals to retirees. In order to provide important information to those that need it, Friends Hospital wanted one comprehensive package, available to both patients and their families, so they can effectively participate in the healing process. A Pathway to Wellness and Recovery is the new marketing theme that DDA suggested and paired with serene scenes of the peaceful environment Friends Hospital uses to promote healing, respect, responsibility, hope, and empowerment. This theme was present on the brochure cover DDA designed and spread inside the folder brochure to each program insert that DDA formatted to fit the content and images Friends Hospital provided. 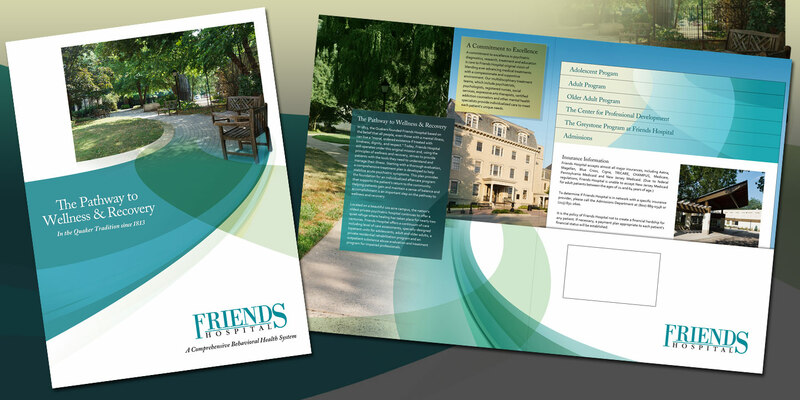 DDA also coordinated print production so that Friends Hospital would have the finished product in hand for an industry conference, where they were distributed to attendees. Each folder brochure is a strong marketing tool, a boon to patients and families in need of information, and a whole new look and brand presentation for the behavioral health facility that started it all.